Jeremy Brecher's history of the largely unsuccessful nationwide strike of textile workers during the great depression, which the union nevertheless declared a victory. The most extensive conflict of the National Recovery Administration (NRA) period during the Great Depression was the national textile strike of 1934. The Depression hit the textile industry long before the rest of society and by early 1929 the mill towns, especially in the South, were seething with discontent. The great grievance was the "stretch-out"; at one mill at Monroe, North Carolina, for example, spinners were required to work twelve rather than eight spindles, four doffers did the work of five, and crews of four carders were cut to three. The result, as Herbert J. Lahne wrote in The Cotton Mill Worker, was that, "a powder train of strikes flashed through an astonished South," many of them "without unionism at all and . . . under purely local leadership whose main concern was . . . the stretch-out. "1 We have described above one such explosion at High Point, North Carolina. With the coming of NRA, which promised the right of workers to form unions, textile workers flooded into the United Textile Workers union; its paper membership went from 27,500 in 1932 to 270,000 in 1934. The NRA Cotton Textile Industry Committee was headed by George Sloan, who happened to be the chief industry spokesman as well. The code set a minimum wage of twelve dollars per week in the South and thirteen dollars in the North. It utterly failed to prevent more stretch-out, or to stop employers from firing workers who joined the union.2 Further, in order to restrict over-production, the NRA ordered a cut-back to thirty hours a week per shift, cutting wages by twenty-five percent. The U.T.W. threatened to strike the industry, but withdrew the threat in exchange for a seat on the Cotton Textile Industrial Relations Board and a government "study" of the industry. The strike held solidly, revealing an unexpected commitment and solidarity, and a month later a U.T. W. national convention, with the militant Southern rank and file in control, voted without opposition for a general strike in the industry, and required the officers to call it within two weeks. The workers condemned NRA bitterly and were only kept from boycotting it by a special appeal from union officers and prominent outsiders. The strikers' tactics showed great creativity in other ways; for example, at Macon, Georgia (and later at various other points), a group of pickets, many of them women, sat down on a plant railroad track and prevented the movement of trains carrying finished goods. Before and at the start of the strike, mass demonstrations were held throughout the South, such as a meeting of 1,000 at Charlotte, North Carolina, and a parade of 5,000 in Gastonia, North Carolina, designed to show the workers' strength. Moving with the speed and force of a mechanized army, thousands of pickets in trucks and automobiles scurried about the countryside in the Carolinas, visiting mill towns and villages and compelling the closing of the plants. . . strikers in groups ranging from 200 to 1,000 assembled about mills and demanded that they be closed. . . .
What happened when the flying squadrons arrived depended on conditions of the moment, the mood of the crowd, the degree of resistance and similar factors. Sometimes they simply picketed peacefully, at others they battled guards, and at times they entered mills, unbelted machinery, broke threads, and fought non-strikers. The growing mass character of the picketing operations is rapidly assuming the appearance of military efficiency and precision and is something entirely new in the history of American labor struggles. Commissaries were set up in various textile centers, and hundreds of strikers canvassed for contributions of food and money. At Hazleton, Pennsylvania, 25,000 workers shut down the town in a one-day general strike on September 11th in support of the textile workers. George Googe, chief A.F.L. representative in the South, urged other workers to give support "without joining the strike," emphasizing that his appeal was not to be interpreted as "a move toward extending the strike to other industries. . . "20 Workers from other industries joined in many of the confrontations that occurred at mills throughout the country, turning them into community struggles. Meanwhile, violent conflict spread through New England. The first strike shooting there occurred in Saylesville, Rhode Island, on September 10th. A crowd of 600 pickets attempting to close a mill (particularly hated for having broken previous strikes) was driven back by state troopers with machine guns (pictured, below). A smaller group of pickets then tried to outflank the troopers and attack the rear of the plant; deputy sheriffs opened fire on them with buckshot. Next afternoon a much larger crowd, estimated at 3,000 to 4,000, imprisoned strikebreaking employees in the mill. As the shift was due to end, the crowd surged forward, captured the mill gate, ripped up a fire hydrant, overturned a gate house, and appeared about to take possession of the plant. In reply, deputy sheriffs began firing buckshot with automatic weapons into the crowd, hitting five. Some 280 National Guardsmen then rode into the scene on caissons. They were pelted with paving stones torn up by the pickets as they clubbed their way to the mill. The crowd tried unsuccessfully to capture the pumping station and set fire to the mill. By the next afternoon, the crowd had grown to 5,000. Hurling pieces of gravestones from the cemetery, they charged the troops and drove them back behind the barbed wire enclosure surrounding the plant. The Guardsmen fired into the crowd, critically wounding three. That night another crowd stoned the Guard, which again fired on them. In the face of such serious disorder, the Sayles plant finally decided to shut down, giving the signal for many other plants in the area to do the same. By September 12th, National Guardsmen were on duty in every New England state except Vermont and New Hampshire. At Danielson, Connecticut, 1,500 pickets battled state troopers. A flying squadron of 200 from Fall River, Massachusetts, was turned back from a factory in Dighton, Massachusetts, when they found every approach barricaded with sandbags manned by police and seventy-five special deputies armed with shotguns. Other confrontations occurred at Lawrence and Lowell, Massachusetts, and Lewiston, Maine, but the New England violence reached its peak at Woonsocket, Rhode Island. The mill which was the original scene of rioting there had been organized six months before, whereupon the union members were fired, leaving much bitterness behind. The evening of September 12th, Governor Green of Rhode Island read a proclamation over the radio urging rioters to return to their homes. Instead, ever-increasing masses began to pour down on the Woonsocket Rayon Plant in a "sullen and rebellious mood." At midnight a crowd of about 500 let fly a barrage of bricks at the police guards at the plant, then attacked. The police replied with tear gas grenades, many of which were caught and thrown back "with telling effect" by the crowd. Word of the conflict spread, and the crowd grew quickly to 2,000. At this point, National Guardsmen took a hand, firing 30 shots into the front ranks of the crowd, hitting four, one fatally. At the shooting, a correspondent reported, "The crowd went completely wild with rage." The crowd grew to 8,000 and was only quelled by the arrival of two more companies of National Guardsmen, who put the city under military rule. The Woonsocket Rayon Mill, source of the conflict, was closed.
. . . Communists. . . were solely responsible for the serious uprisings that took place in both Saylesville and Woonsocket. The strike - like the industry - was centered in New England and the South, but it spread through the rest of the eastern seaboard as well. 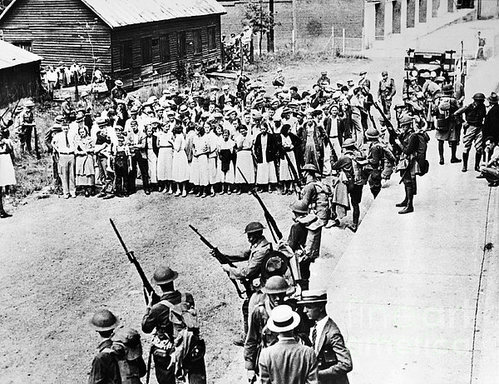 In Pennsylvania, for example, 47,000 struck, eleven cars filled with special guards were attacked and some of them overturned, and in Lancaster, police charged that women strikers were using "old-fashioned hat pins" to attack non-strikers. Meanwhile, the struggle in the South reflected "a grim determination on both sides to hold on at any cost. "25 A road approaching the Cherryville mill in Gaston County, North Carolina, was dynamited September 10th, as was a mill generator at Fayetteville, North Carolina, a few days later. Five pickets in a crowd of 400 wearing "peaceful picket" badges were bayoneted by soldiers as they yelled "scab" at strikebreakers entering a mill at Burlington, North Carolina. Non-striking workers in Aragon, Georgia, armed by their employer and led by a deputy sheriff, dispersed a flying squadron by threat of force. Such confrontations continued all week throughout the South. The employers' effort to stampede the strikers back to work failed overwhelmingly: on September 18th, the AP reported 421,000 on strike, 20,000 more than the week before. 1. Herbert J. Lahne, The Collon Mill Worker (N.Y.: Farrar & Rinehart, 1944), p.216. 2. Bernstein, Turbulent Years, pp. 302-4. 4. Alexander Kendrick, "Alabama Goes on Strike," in The Nation, Aug. 29, 1934, p. 233. 5. New York Times, Sept. 4, 1934. 6. New York Times, Sept. 5 & 6, 1934. 7. New York Times, Sept. 5, 1934. 8. New York Times, Sept. 16, 1934. 9. New York Times, Sept. 5, 1934. 11. Robert R.R. Brooks, "The United Textile Workers of America" (unpublished Ph.D. dissertation, Yale University, 1935), p. 376. 12. New York Times, Sept. 10, 1934. 13. New York Times, Sept. 6, 1934. 18. New York Times, Sept. 7, 1934. 20. New York Times, Sept. 10, 1934. 21. New York Times, Sept. 12, 1934. 22. New York Times, Sept. 13, 1934. 23. New York Times, Sept. 14, 1934. 25. New York Times, Sept. 12, 1934. 26. New York Times, Sept. 16, 1934. 27. New York Times, Sept. 18, 1934. 28. Brooks, p. 378; New York Times, Sept. 19, 1934. 29. Bernstein, Turbulent Years, p. 314. 32. Cited in Bernstein, Turbulent Years, p. 315.